Back in 2006, I made some predictions about where mobile learning might be heading, including the use of augmented reality or “Heads Up” data displays to provide information on a learner’s environment and allow learning “in situ,”. Augmented reality has recently really taken off during 2009, with a number of apps on various GPS-enabled mobile phones (notably the iPhone) providing information layered over a camera view of the world; one example of this is the Layar application. I also predicted the use of image recognition that would effectively enable “visual searches” of objects and images in the real world (and indeed, I reiterated this belief in a comment just yesterday on Stephen Downes’ blog). Want to know more information on that bridge over there? No worries! Just point your camera at it, and image recognition will provide some suggestions on appropriate websites to look at. 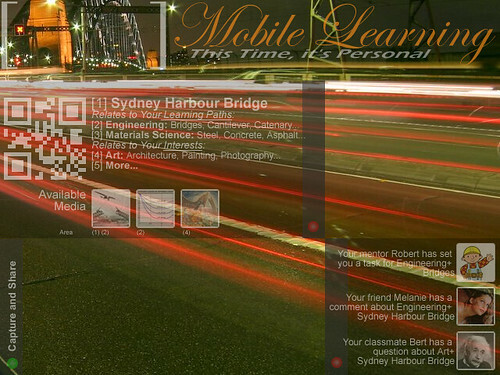 I think Augmented Reality would enable mLearning’s real potential. We need to watch out for AR in 2010. The UpsideLearning Blog also covered this a couple of weeks back.